I was on Facebook the other day, and had posted something to my wall, about high fructose corn syrup, and somehow got on the subject of meat. I didn't post anything that to me was offensive, but one of my friends who is a doctor "resident" said that I should be careful what I post, that most of what I post is untrue. With the research that I have been doing about meat, I had stated that it wasn't good for you, because of the saturated fat, and that it was artery clogging. She stated that meat is the only way to get protein, and vitamin B12, and Omega 3s. First of all, there is lots of protein in plants. I don't know where people come up with saying that you can only get protein from meat. This is a myth. Ok, I'm not a doctor, but we will cover that at the end of the article. 1. Nuts: I love nuts, and they are packed with protein. There are 4 grams of protein in 1 tablespoon. Also nut milks like almond, cashew are packed with protein, and more calcium that cows milk. Also nut butters are wonderful. 2. Seeds: Lots of ways to get your seeds during the day. Hemp seeds have 10 grams of protein per 3 tablespoons. I enjoy these on my salads. Put some ground sunflower seeds in your veggie burgers. 3. Beans: Legumes which include pinto, black, lentils, chickpeas, lima. and several more. I try to include some kind of bean in my diet everyday. 1/2 cup of beans gives you 20 grams of protein! Oh and don't forget the fiber! 5. Cereal: Check your labels to see how much protein your cereal contains. I eat oats every morning, and there is 6 grams of protein per cup. Don't forget your ground flax seed! Flax contains your Omega 3s. Which you need in your diet. 1-2 tablespoons is recommended everyday. 6. Supplement or protein bars: Also read your labels. 7. Green leafy vegetables: Now I don't eat a lot of these because they cause kidney stones in my body. Moderation for me. There is only .9 grams of protein per cup of spinach, but you can get a punch if you drink a green smoothie. So how much protein do we really need? For men they need 63 grams per day, and females need 52 grams. Here is a chart to show you how much protein you can get every day. Ok, so what about the vitamin B12 that we need for our brains? My doctor recommended a sub-lingual "under the tongue" vitamin of 2500 mcg every week. Boom baby! I think we all need to do our own research. Talk to your doctor, read etc. The book that I'm reading called How Not To Die (incidentally an awesome read!) by Michael Greger MD states that med school students only receive 1% of the training they need in nutrition. This is because there is no money in preventative! Doctors get reimbursed from pharmaceutical companies for prescribing their medications. Doctors now don't have the time to sit down with you and discuss how a diet rich in plants can prevent and reverse diseases. Sad really, because the US and other countries could really use it. I don't recommend arguing with anyone about diet, and I don't think that one diet fits all. Just be an example to those around you, and do your research for yourself! If this works for you awesome, but if you want to try something else great! This is working for me! 18 pounds are gone. Feeling great! This past weekend my husband, my son and his wife and baby girl went to Boise for my in-laws 60th wedding anniversary. We left on Friday night and returned Sunday. It was a 950 mile round whirlwind of a trip. It was so much fun to be with my son and daughter in law, and my sweet grand baby. I worried what I would eat during this trip, but we came prepared with snacks and places we could go to eat out. We took a cooler with us, and in that cooler we had cut up cantaloupe in a bowl, and some bananas. I also picked up a bag of what is called Bare at Costco. They are dried apples with no oil or sugar added. I also had some seaweed chips. We arrived at my son's house around 8:00 am, because my husband had to do some work in their town, so I sat with my daughter in law and son and visited with them and enjoyed the grand baby. Since my son is also eating this way, his wife made a yummy cream of broccoli soup, much like the one I made before but with potatoes instead of cashews. It was yummy. My husband got back about 1:00, and we left after my son got home from school around 3:00. We drove until our tummies started to growl, so we stopped at the nearest Subway. I had decided before we stopped that I was going to get a sandwich that was compliant to the way I wanted to eat. I ordered a foot long veggie sub, no cheese with some sweet teriyaki sauce and vinegar on whole wheat bread. Now I know that their bread is overly processed, but under the circumstances I did the best I could. I ate the whole thing and was satisfied. I didn't drink pop, water was the beverage of choice. We arrived super late to Boise, so no need to eat again until morning. My sister in law put us up for the night. We got up fairly early the next day and went to Denny's for breakfast before heading to the in laws to surprise them. They didn't know we were coming! We were pretty excited about this visit. Now Denny's is hard. There are no choices for a plant based dieter. I ordered an veggie omelet amde with egg whites, English muffin, and fresh fruit. I could have had fried potatoes, but I didn't want all the extra oil. Instead I got the fruit which was perfect. I didn't eat all the egg, but loved the veggies of spinach, mushrooms, zucchini, and peppers. I ate 1/2 the English muffin, and was stuffed. We arrived to my in laws, and my father in law cried when he saw his first great grandchild. We all were crying. It was a perfect surprise. We spent the good part of the morning with them before the rest of the family came. My husband has 5 siblings! It was awesome to be there, and to renew our acquaintances. Then came lunch. My sister in laws have been watching my facebook site and decided before they ordered lunch that they would order something plant based for those of us that ate this way. They also ordered lasagna and fettuccine. I had a taste of the lasagna, but mostly ate salad and bread sticks. The lunch was from the Olive Garden. 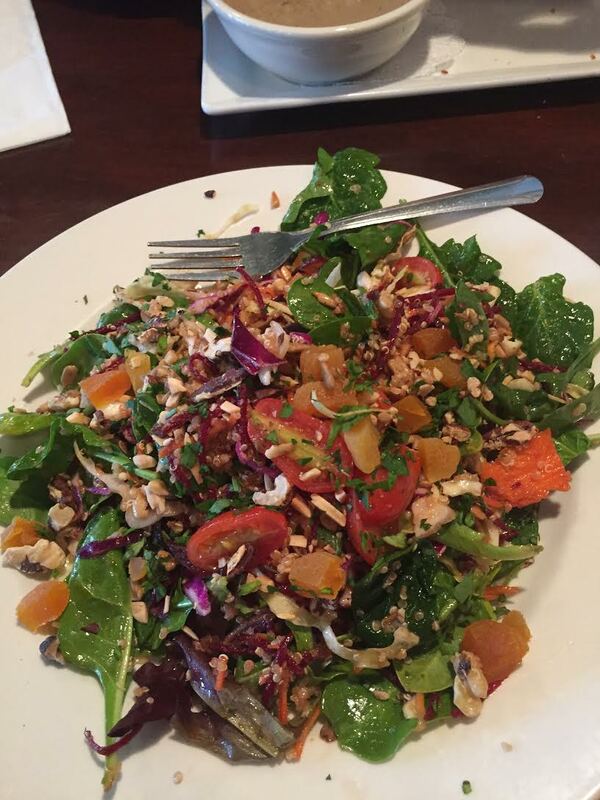 The salad was yummy, but I like so much more in it besides just lettuce and a few tomatoes, onions and olives. Hey I stayed on track! 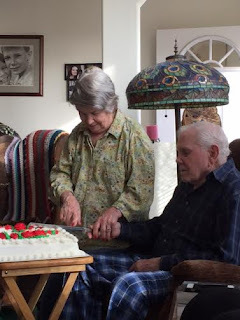 Then came the cake. I only had a tiny slice. I knew when I got back I would have to start back 100%, which I have. There are a lot of groups on facebook that are crazy about never straying from this way of this type of eating. My opinion of this is; once in a while is not going to hurt you. One meal, one treat... When you get back to home you can start up again. Sometimes it can be difficult, but remember the reasons why you are eating this way to begin with. Is it for your health? Is it for the animals? Whichever you choose just come back, and if by chance you don't think you can, then don't cheat. I personally feel it is better to have family and friends than to not enjoy yourself and eat what they are eating just once. I did really well in not going overboard. The picture below is not from our trip. It is from another restaurant on another day, but if you talk to your waiter that works at the restaurant you are in, sometimes there is a chance that they will have what you need, and a lot of places are catching the vision of plant based diets. Also check online at http://www.happycow.net/ If you do your homework before you get there, then you can find places around you that comply with your way of eating, and know that you have choices without wrecking havoc on your decisions. Often times we go to Cafe Rio, where I just order a taco salad with more beans in place of the meat. It can be done! What is being over weight or obese doing to our bodies?! I came across this article a couple of days ago, and it really surprised me. We can see what our bodies look like on the outside, but do we ever really think about what they look like on the inside I never did. The first thing my husband noticed were the ankles of the heavy set person on the left. 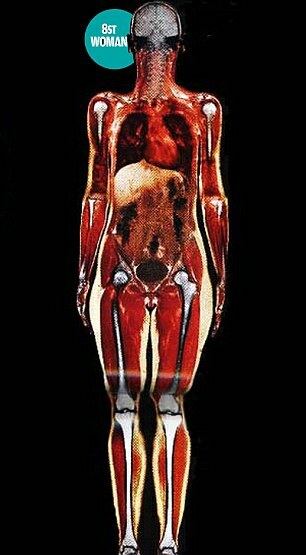 The extreme weight is causing our joints to shift. How many of us have sore feet and joints? Most likely from the strain of the weight we are carrying around. My husband and I both have suffered with Plantar Fascia. It is a painful band of tissue (ligament) that connects your heel bone to your toes. It supports the arch of your foot. If you strain your plantar fascia, it gets weak, swollen and irritated (inflamed). Then your heel or the bottom of your foot hurts when you stand or walk. Athletes have issues with Plantar, but hmmm, my husband and I are not athletes at all. It is caused by too much weight. Since being on this new lifestyle I haven't had a flair up. Losing 15 pounds has helped. Notice the neck. The muscles around the neck are surrounded by fat. This can cause headaches, apnea, and snoring. Apnea happens when the neck muscles close off your airway, and block breathing. This can cause memory loss, shortness of breath, high blood pressure and even strokes, and death. Another thing that we noticed was an enlarged heart. This is probably the most important thing to study as you can't live unless your heart is working properly. 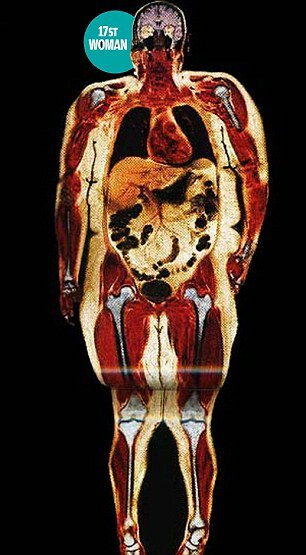 Fat around the organs is more dangerous. It is known as fisceral fat. It can be toxic and poisonous. Fisceral fat can pump out chemicals that have been known to cause heart disease ,type ll diabetes and some forms of cancer. The abdomen is the worst place to accumulate fat. We think as we age that it is just normal for that spread, but it's not. I thought it was! That fisercal fat secretes hormones called leptin which are associated with type ll diabetes, and changes to metabolism. Extra weight on the pelvic floor can also cause incontinence and hemorrhoids. None of us want that! I thought this article was interesting, and thought provoking. We have to know what is going on on the inside so that we can work our hardest on the outside to change things. My husband and I have noticed great changes to our bodies since starting this lifestyle. He has lost 2 inches around his waist, and lost 12 pounds. I can wear pants and outfits that I haven't been able to wear in some time, and I have lost 15 pounds. I have more energy, and I'm not as sluggish, and my headaches are gone. My blood pressure has gone from 150/84 to 117/74. This is thrilling to us. It has been a struggle from time to time, but the benefits are worth every struggle. On Thursday I had to begin prepping for a Colonoscopy. Oh joy! I had to just have clear liquids the whole day. I couldn't drink just vegetable broth because really that stuff is just nasty all alone. I love it in soups with other vegetables, but by it self it has no taste, and no satisfaction. So chicken broth it was. I also ate a lot of jello. Do you know where jello comes from? Bones of animals. I tried not to think about that. I was hungry! Come to find out there is vegan jello at stores now. I certainly didn't know that until it was too late to get any. Next time! So that whole day I drank. Then came the awful drink...Magnesium Citrate. This stuff is nasty, and the kind I got was lemon flavored. There is no way to cover up the taste, and I tried to put it in soda. ICK! The soda pop was too sweet for me. I hadn't had it in over 6 weeks. Magnesium Citrate is a sodium solution to help a person empty their bowels to get ready for surgery or colonoscopies. Boy does it do that! I should have just sat on the toilet with a blanket the whole night because I certainly didn't sleep! It cleaned me out. Sorry, I know it's a bit gross, but it was real! At the start of midnight I was to not drink or eat anything including gum or mints. By this time my stomach was growling big time. My last sip of water was at midnight. Then the next morning I was asked to be at the hospital by 9:30am. I had zero energy, and my sweet husband drove me to the hospital. When I was all prepped and ready to go, I had to wait an additional hour and a half because as usual you always have to wait for the doctor. By the time the staff took me in, I was exhausted and starving! My blood pressure was 118/74! I was tickled about that! It hasn't been that low in a very long time! My blood sugar was 107, and that is normal for me. 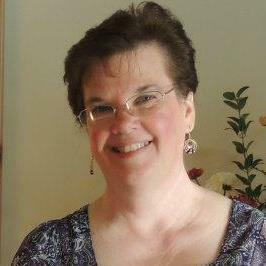 I have never been on insulin, and I want to keep it that way. The staff gave me my drugs to help me relax. The Versed also makes it so you forget most of what happens. Most of it I did forget, but I was able to watch the screen above my head and watch the procedure! I know I'm weird, but I found it fascinating! lol I saw the inside of my colon, and because I had researched what a polyp looks like, I knew what to look for. There weren't any! No biopsies were done! It's healthy! For that I'm so grateful! So we came home, and I was starving! I had a nap because I was sooooo tired, and then my husband bless his heart went to get pizza. Yeah I know, but it was better that eating the couch! He got me roses and ice cream. Ben & Jerry's to be exact, and my favorite flavor Cherry Garcia. How could I resist? The pizza was thin crust vegetarian, so that was better than some other ones. It tasted so good, and I polished off the pint of ice cream! Ugh! I went to bed at 9:00pm, and didn't wake up until 7:00am. I felt refreshed and so much better. I vowed to never eat that way again. It made me feel lethargic with a headache. We all make mistakes, which should remind each of us that we aren't perfect. If you fall off that wagon, climb back on and keep riding! I recently was kicked off a Facebook page that was called New Vegan Support. Since starting my "Vegan" diet, I have learned a lot! I had a lot of my questions answered as how to eat the right things in order to get what I needed most..ie.. vitamins and minerals. Then I asked a that dreaded question which I thought was legitimate, but it didn't go down too well. My question was, "How can we be healthy and still eat all the vegan junk food?" Oh boy, I had members come down on me with hobnailed boots. They told me that this group was not for a healthy diet, but to save the animals! In other words they were all PETA activists. Now don't get me wrong. I have seen a lot of many movies containing explicit clips from slaughter houses, and believe me, they are incredibly cruel to these animals. These people that work there will shoot an animal in the head thinking it kills them instantly, but sometimes it doesn't and the workers slit that animal's throats anyway while it's still alive and struggling. It is just awful! You can search Youtube if you really want to see what goes on, but trust me it will make you cry. I started watching Earthings, and had to turn it off because it made me sick to my stomach. Vegans also don't consume milk for the same reasons that milk producing cows are not served very well. In order for a cow to continue making milk, they are inseminated shortly after they give birth. When they give birth, the cow has just enough time to clean up the afterbirth, and lick her calf and then the calf is taken away to live in a crate so that it can be killed in a few weeks for veal, while the momma cow cries for her calf. Most dairy cows live 22-25 years, but because these cows become exhausted from being pregnant all the time, they usually die at 4 years old. After that, they are slaughtered the same way as meat cows are. Vegans also will not buy leather of any kind such as shoes or belts and purses, and they will protest if someone else chooses to. These people, or at least this group was not compassionate for others that didn't see their point of view to all this. They invited me to leave. Wow! I was shocked! I would have never done that to anyone. We all need to be accepting to others, regardless of their beliefs. I learned that a very long time ago. Well anyway, off to bigger and better right? I found another group on Facebook who are very accepting of others and I have learned so much from them. 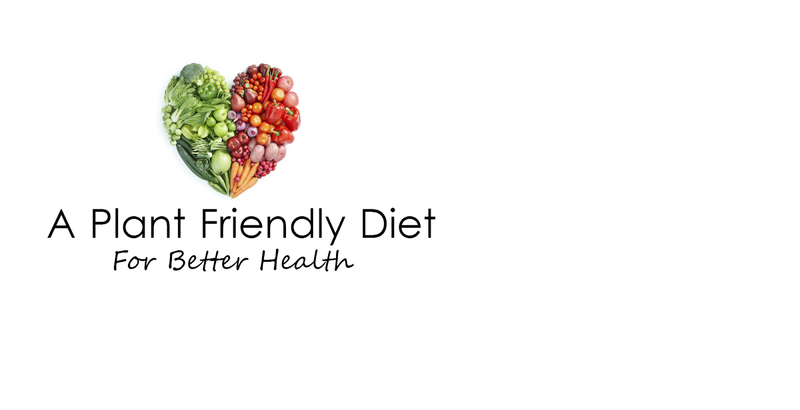 There are many groups on Facebook that are "plant-based diet eaters." I, for one started eating this way to help with my weight, and cure my type ll diabetes for good. I have seen both sides to this coin, and I have to say that I wouldn't want any animal killed in the way they do it in the slaughter houses. I don't drink milk or eat dairy products because of the cholesterol issues, and the oils and saturated fats that are contained in them. The dairy industry would like you to believe that milk is a good form of calcium. Did you know that vegetables contain calcium? Cows milk is supposed to be used for raising a baby cow into a very large animal, in a short amount of time. Now did I give my kids dairy? Yes I did, but I have learned a lot since then, and given another chance I wouldn't do it again. Become educated so that you can make wise choices that affect yourself and others. I have recently done a lot of reading on diabetes and obesity, mainly because I have both. I have controlled my diabetes with diet, but because I gained some weight, my provider told me to lose the weight so that I wouldn't have to go on insulin. It is so frustrating because the older I get the harder it is to lose the weight. Why oh why does this happen? As we age, our metabolism changes. We are less active and we eat the wrong food. We go on diets that are crazy! We starve ourselves, we eat processed diet foods, and we eat oil that is "supposedly" healthy. Food manufactures tell us all the time how healthy it is to use "heart healthy" oils. Don't you think that is an oxymoron? How can artery clogging oils be heart healthy? Look what happens to the arteries when they start filling with plague? Why would the food manufactures tell us differently? Money! They want you to buy their product. Plague causes heart attacks and strokes, but they aren't going to tell you that! So when I was with Weight Watchers, they allowed snacks that you could get at the store that were 100 calorie snacks. I'm not saying anything bad about Weight Watchers, because they did work for me. However, after all the reading and studying I have done, now I look at labels. A LOT! We have all heard that when they remove or lower the fat, they up the sugar and the salt. It's true! Next time you go to the store, have a look. What is spice extractive, potato starch-modified?! There is the oil and sugar! Don't just read the nutritional facts, read the ingredients. Lots of times it contains high fructose corn syrup which is pretty much in everything! Oils also causes big time trouble with diabetes. Dr. Neal Barnard, one of my sources, has done a lot of studies with relation to oil and diabetes. Okay, so you don't eat fish, but isn't there fat in all meats? All meats contain saturated fat. It doesn't matter what meat you eat, fat is fat. So you are thinking what do I eat? How do I saute my veggies? I had to learn as well. Just add a little water to your veggies in a frying pan. Mushrooms and onions are loaded with water. You won't need to add much. Keep an eye on it as you don't want to burn it. Okay, so our bodies need fat you say. Healthy fats such as avocados, nuts and seeds. The nuts that are the healthiest are almonds, brazil nuts, walnuts, pecans, cedar or pine nuts, and my favorite, cashews. BE CAREFUL though, my husband and I bought some mixed nuts at Costco and ate them like popcorn and guess what? We didn't lose any weight. Nuts are full of vitamins, but moderation in all things. I have had a hard time for many years with kidney stones, so every morning I drink fresh lemon juice in very warm water through a straw so it won't hurt my teeth. Then I came across someone that does the same thing, but adds 1/8 of a teaspoon of cayenne pepper to the lemon water. She stated that cayenne pepper is good for digestion. I found many other reasons to eat it everyday. It took me a bit to get used to it, but now I love it. Here is what I found. I have been doing a lot of reading on potatoes. They are an amazing vegetable. When I think about people eating nothing but potatoes, I think of the Jews in concentration camps. The people did get maybe a potato skin in their watery soup, but they starved from lack of nutrition and hard labor. 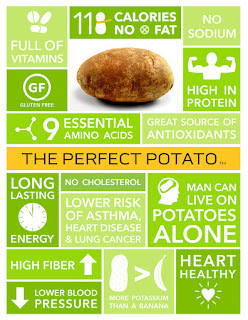 As you can see from this picture, potatoes have a lot of nutrients in them. The Starch Solution. In this book is a quote. 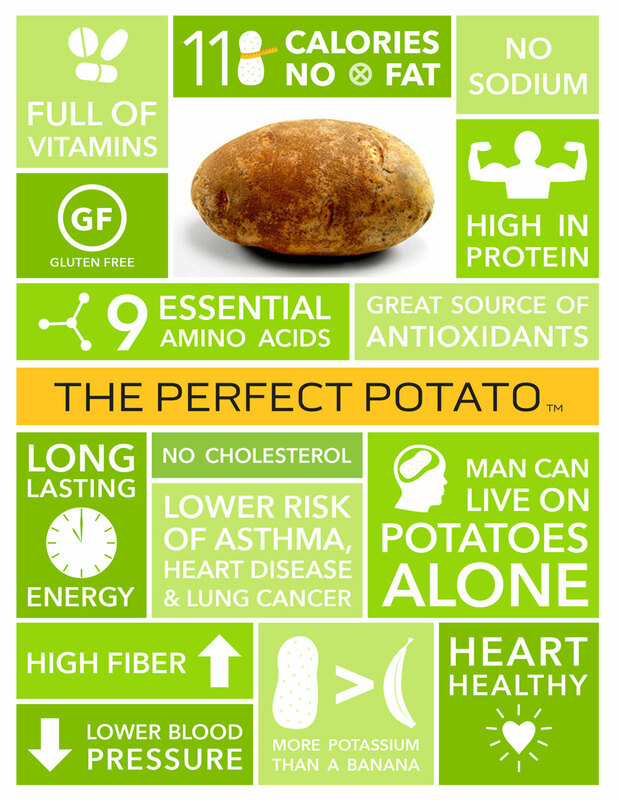 The potato is such a great source of nutrition that it can supply all of the essential protein and amino acids for young children in times of food shortage. Eleven Peruvian children, ages 8 months to 35 months, recovering from malnutrition, were fed diets where all of the protein and 75% of the calories came from potatoes. (Soybean-cottonseed oils and pure simple sugars, neither of which contains protein, vitamins, or minerals, provided some of the extra calories. )12 Researchers found that this simple potato diet provided all the protein and essential amino acids to meet the needs of growing and small children." Check out the video. There are several people in the vegan community that will eat nothing but potatoes for 6 months at a time. Now I don't think I would ever do that as I really like variety. I do have fries made up of 3-4 potatoes seasoned with garlic and onion powder, baked at 450 until they are crispy though, and they are savory, and satisfying. Oh and it makes for a cheap lunch! Little ketchup on the side, and I'm good until dinner. You Say I Can't Eat Meat? "You don't eat no meat? Oh that's okay I make you lamb." Haha! Many of us have seen My Big Fat Greek Wedding. One of my favorites! Yes I haven't had meat for 5 weeks. I have made the choice to steer clear of it. I'm not a PETA activist, but I am staying away from animal products for my health, so I'm considered a WFPBD whole foods plants based diet. What are your thoughts about giving up meat? When I first looked into this way of eating, I thought no way am I going to give up meat. I love hamburgers, and ham, and chicken, and ribs! I love it all, and sometimes I have a bite or two now, but after looking into the cause of diseases I have given up meat about 99.9% of the time. Let me tell you why. A doctor by the name of Neal Barnard (if you want to read up on him here is his blog link (www.PCRM.com) has done extensive research on why meat consumption is not a healthy choice not even if animals are grass fed or organic. Any kind of meat contains saturated fat, this includes chicken and fish. The bad cholesterol LDL (low density lipoprotein) is the cholesterol that causes atherosclerosis or hardening of the arteries. It is that plaque that clogs arteries and causes heart disease and heart attacks. 2,200 Americans die each DAY from cardiovascular disease. Not only do animal products cause cardiovascular disease, but other diseases as well such as arthritis, asthma, cancers, colitis, constipation, dementia, diabetes obesity just to name a few. What about protein you ask, because I don't consume dairy products either. Have you ever looked on the ingredients of a loaf of bread? Grains, legumes (beans), vegetables all contain protein. 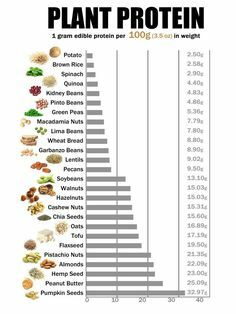 Here is a great chart to show you that plants have enough proteins in them for your needs. Everyone is different in protein needs depending on how active you are. When I first started this program, I was at a loss of what to eat. I had lots of meat in the freezer, and what about my husband! How was he going to react to all this! We started on a Monday, and by Tuesday night I was pulling my hair out. I craved meat and dairy. How could I give up on cheese and yogurt. Wait I still had yogurt out in the fridge. Tempting! I then began to think wait, I made a commitment, and for my health I needed to stay on track. I also decided it was time to de-junk our house of unwanted products, anything that was tempting me to lose it. If it wasn't there, I couldn't eat it! We gave most of it to the missionaries in our church. Some say to just throw it away, but I felt that was wasteful. After that I started to look up recipes, and let me tell you, there are a ton out there. I will be sharing mine and what I thought of them. I hope you enjoy reading, and if you feel inspired, let me know and share it with others!